perfect for exploring Northumberland national Park with the new 'The Sill' visitor centre and the main central section of Hadrians Wall World heritage Site. 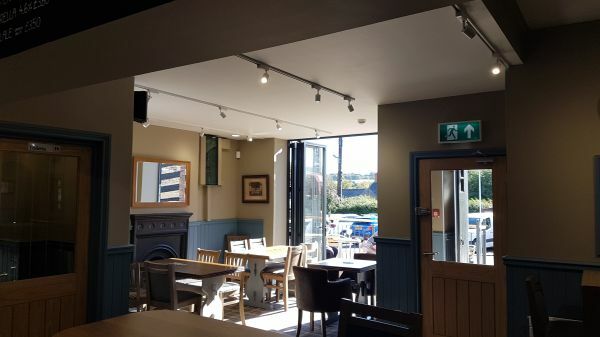 The Bowes Hotel provides modern comfy rooms with a traditional breakfast in a village pub setting. 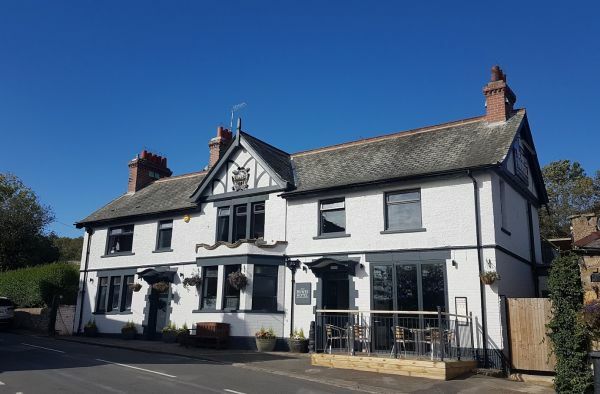 Completely renovated in summer of 2018 The Bowes Hotel is situated in the heart of the Village with fantastic views over the Tyne valley. Easily reached from the nearby train station, just 150m away. All guest rooms are on the first floor with access by way of staircase only. Approximately 30 steps. The Bowes is just off the A69 in between Haltwhistle and Haydon bridge. Very easy to find with parking opposite by the Village green. The Bowes Hotel is excellently positioned for public transport as is on the main Carlisle to Newcastle bus and train routes. The bus (685) stops at the Bowes every hour and the Bardon Mill train station is just 150m away. Restaurant is open Wed/Thurs 4 to 8pm, Frid/Sat 12 to 8pm, Sunday 12 to 4pm. No evening meals Sun/Mon/Tues during low season. Arrived on a sunny Bank Holiday Friday and were delighted with the outside area to sit and enjoy the afternoon sunshine. Our room "The Pottery" was clean and well equipped. Lovely balcony overlooking the pottery and a small kitchenette. Aware that food is only served between 5-8pm we headed down to eat around 7pm. The menu is not huge and sadly 2 of the main courses were already sold out. We opted for steak and a trio of burgers. Sadly the burgers were so overcooked as to be dry and almost inedible. Steak although it looked good was also over cooked. Staff were excellent and attentive and the atmosphere was nice. Unfortunately our nights sleep was tainted by the complete lack of soundproofing to the next door room. This was a room which could be reached via an adjoining door. Certainly ideal if travelling with kids but impractical for strangers! Breakfast was slow and somewhat chaotic and again parts were over cooked. So sadly disappointing dining for an otherwise pleasant hotel. We were house hunting in the neighbourhood and stayed here as it was most central. An absolute gem. Ian and his wife were very welcoming and went out of their way to make sure we had all we needed. The room had a most comfortable bed, was beautifully decorated and had a super shower. The hotel is popular with both local residents and visitors and justifiably so. We ate a wonderful dinner here, and the breakfast was delicious - freshly cooked and beautifully served. We have no hesitation at all in recommending this hotel and have every intention of staying there again. I’ve just returned home from a week in Bardon Mill - which was absolutely lovely. But the highlight was undoubtedly The Bowes Hotel. The new owner has quite obviously put his heart and soul into renovating the place and has done a first rate job. The staff were friendly and enthusiastic and the beer most excellent (especially the locally brewed Vindalanda!). The food was amazing for such a small place and the fish and chips were the best I’ve ever had. I should maybe qualify this and say that I’m 53 years old and have eaten mountains of fish and chips in my time! A brilliant place and definitely worth a visit if you get a chance. We booked a room at The Bowes Hotel for 2 nights. The owner and staff were extremely welcoming and helpful, going out of their way to make sure that we enjoyed our stay. They provided us with invaluable advice on walks we were gong to do along Hadrian’s wall (we ended up totally changing our itinerary). A stickler for cleanliness, I could not fault the rooms or amenities, all of which have been lovingly renovated by the owner. Located close to the train station, this was also an easy commute from London. I would definitely recommend this establishment to friends and family. Thanks so much for a lovely stay! It's such a treat to have great food on the door step that caterers for vegetarians. Have just had the cheese and leek souflete (think that's how it's spelt 😀) and wow I could have eaten it all over again had I not been so full. I'm looking forward to coming back next week for the vegetarian lasagne and then I'm sure I will be back for the curry in the not so distant future. Well done to all, especially their very talented chef.